Women entrepreneurs are happier than men entrepreneurs and women who don’t start their own businesses, and this well-being increases with age, according to a recent report by the Global Entrepreneurship Monitor. 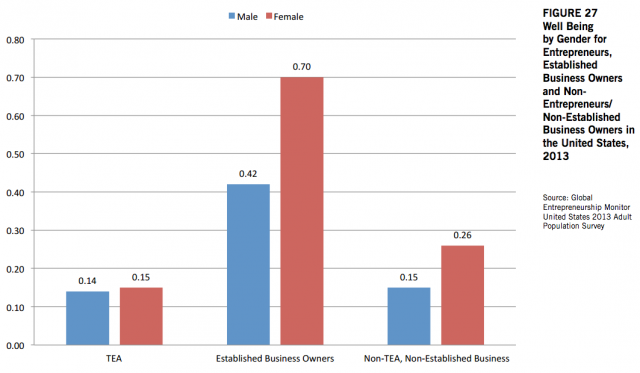 When women are first starting their businesses, their well-being dips significantly, in part because it is higher than men’s to begin with. This dip lowers them to the same level of happiness as men starting their business, but the dip itself, and the subsequent enormous climb after the business is established, is illuminating. No one starts a business expecting it to be easy, but the initial difficulties can be enough to deter many women from continuing. How many more would stick it out if they knew the fulfillment that awaited them, that once their businesses were established, they would experience a happiness beyond anything they’d ever experienced in their lives? The report also found that entrepreneurs in their mid-40s and beyond rated their well-being the highest of any other age group. In other words, your chances of starting a business that is meaningful, fulfilling, and profitable only increase with age. So what do we do during those initial difficulties, when we are putting our ideas into action, securing funding, and getting our visionary businesses off the ground? We have to account for lag time, the time for our actions to germinate and bear fruit. This requires learning to live in-between, being comfortable in that timeless space between past and future, between your old story and the new one you are creating. Living in this space is a key component to being Ageless, and you’ll find that mastering it during the difficult lag times will give you the ability to view your successes through a visionary lens, seeing ways to go beyond doing well to doing well doing good—for your community, the planet, the generations to follow. Becoming an Ageless Entrepreneur means living and working on multiple planes, deeply within the moment as well as transcending the work you are doing and seeing how it connects the bigger picture of time and space. How you connect to the bigger picture, and how your actions and your business can go beyond mere success to visionary. Ageless Women Entrepreneurs are poised to rewrite the history of our future. Will you join them?